Style, design and opulence combine with luxury standards and a majestic setting for your exclusive Cornish holiday in the heart of St Ives, West Cornwall. Valentina has been thoughtfully created to welcome 6 guests within 3 bedrooms and 2 bathrooms, a spacious open plan living, dining and kitchen space. Perfect for a winter hideaway as a summer base, gather friends and family and explore this beautiful corner of Cornwall. Valentina offers allocated private parking and welcomes one well behaved dog to stay. 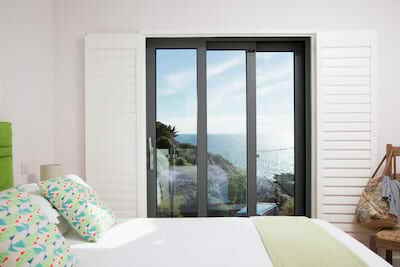 Valentina is located within the newly appointed Chy-an-Porth apartments with its commanding location high above Portminster Beach and St Ives Bay. Once inside this generous apartment offers ample space for up to 6 guests to unwind and relax. A chic fusion of mustards, black and muted greys add a cosmopolitan twist to the coastal design whilst the finest linens and furnishings have been thoughtfully chosen to complement the luxury ambiance. A central hallway leads into the main social spaces including a welcoming living area, dining and kitchen areas. 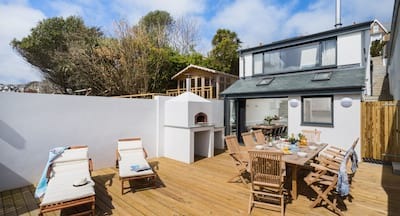 The kitchen is modern in style with fully fitted mod cons, a chefs dream, this inspiring kitchen welcomes creative holiday cooking using the very best of Cornish fare. Enjoy the luxury of dining against the sea view backdrop be it simple supper or sunny breakfast. The living area is a wonderful meeting spot for all the party to catch up as a group, cosy up on the oversized sofa or stretch out for a lazy afternoon. 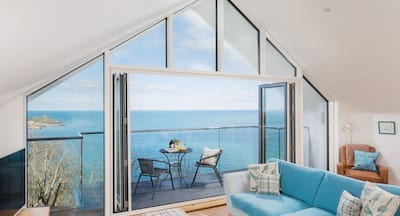 A perfectly placed 2 seater sofa nestles within the bay window that frames the jackpot views of St Ives blue bay and beyond up the North Cornish coastline. To the rear of the apartment 3 beautifully indulgent bedrooms have been creatively styled and dressed from the country inspired cow parsley wallpaper, the sumptuous fabrics and bespoke artwork. Valentina offers a family walk-in shower room and ensuite within the master bedroom each with designer tiling and fresh contemporary feel. Step from the dining space onto the balcony offering dining furniture and super sea and coastal views. Step from your holiday door and into the hubbub of St Ives. The white sands of Porthminster Beach are located just below the apartment and has recently been awarded blue flag status for its azure blue waters and clean sand. Wander along to the harbour front and take in Cornish life at its best, a number of cool cafes and bars open their doors year round alongside tempting restaurants. Many world renowed artists have chosen to make St Ives their home and the town oozes culture, art inspiration and collection of galleries including the Tate St Ives. Take to the coastal paths of the South West Coast path and take in some of the best seascapes in the county heading West towards Zennor or North towards Carbis Bay. Day trips around Cornwall are an easy option, head to the South coast and the popular towns of Falmouth and Fowey or further afield to Padstow and its wonderful food culture. There are 10 steps from the parking area to the main building door. Once inside there are 2 flights of stairs (15 steps each) and further 3 steps up to the apartment door. There is an area of currently unused land adjacent to the property. The road below Valentina is the main road into St Ives centre. Beautiful apartment, tastefully furnished and well equipped. Very comfortable - including the beds. How could anyone not enjoy the wonderful view from the bay window? Valentina is well located for the beach and town, it is light, spacious and beautifully furnished. The sea views are captivating. Spotless, and very well equipped. Stunning property, beautifully decorated and very comfy furnishings and beds. it did indeed feel very luxurious! And your staff were incredibly helpful! A first class property with a great location. We shall certainly book it again in the future. it was a lovely location and the open plan living was ideal for spending time together as a family. everything was very good, great views, lovely weather - what more can you ask for. Your a good company to deal with and will do again in the future.